If you are reading this post, then its safe to assume that you have been a Windows user since many years and are accustomed to the really useful feature of Quick Launch Toolbar in Windows. Also like me you miss this feature in Windows 7. Atleast that is the case with me. 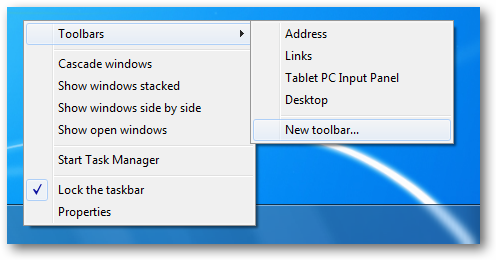 So lets see how to add a Quick Launch Toolbar in Windows 7. Windows 7 has an option to pin any program to the taskbar, but I prefer to have multiple small shortcuts, handy, even though I don’t use them very often. Pinning them to task bar, would just clutter it, and I prefer it to remain clean, and keep the shortcuts in the Quick Launch Bar instead. 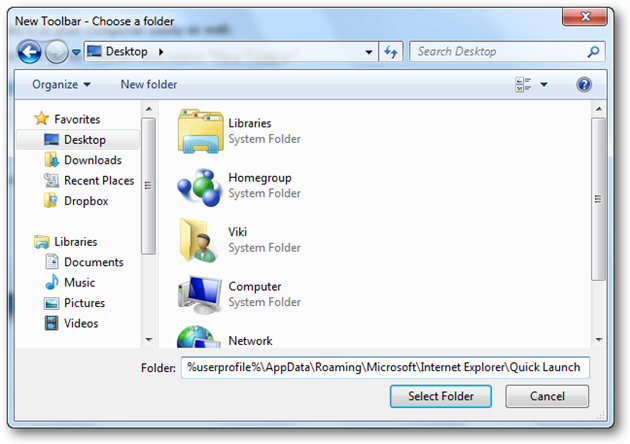 So here’s how a Quick Launch Toolbar looks in windows 7. In the window that opens up, we see a text field labeled “Folder” at the bottom of that window. We need to type in the command shown below into the folder text area. To understand better, look how its done in the image below. Once you click on Select Folder button, you will immediately see the Quick Launch Toolbar on the Taskbar to the left of Notification icons. But these shortcuts are shown with full text and are on the right side. Now we need to bring it to its original location i.e to the right of the Start Button. 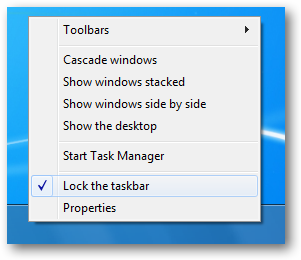 So,we Right click on the Taskbar and uncheck the Lock the taskbar option. Once we unlock the Taskbar, Right click on the dotted area that acts as a slider, just left of the Quick Launch text and uncheck “Show Title”, “Show Text” and also make sure the icons used are of small size. Once this is done we get the original Quick Launch Toolbar, but its currently on the right side of the Taskbar. To get it to its original location like in Windows XP and Vista we drag it with the same dotted area towards right side of the Start button. In case your pinned programs move to the right you can drag them back to the left just next to the Quick Launch Toolbar. Here is how they look. 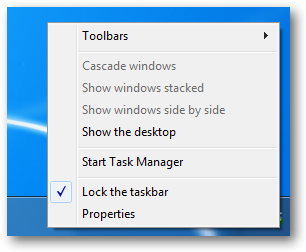 Once you have the Toolbar where you want it, just right click on the taskbar and check the option “Lock the taskbar”. Once the Taskbar is locked we see the Quick Launch Toolbar back in its right location. Quite easy to implement isn’t it and we now have our beloved Quick Launch Toolbar right where we want it. From here on you can drag any program shortcuts to this bar and they would be added in. Next articleHow to create a Firefox Profile and Manage Multiple Profiles.